Attracted from a young age to Archeology and the Arts, Art Conservation became a true passion, blending the manipulation of Historical Artefacts, manual know-how, Site Preservation and the respect for historical testimonies among many more valued aspects. It is through this mulidisciplinary approach, in direct link with the Art pieces and in various contexts, that I practise my work. Strengthening of artefacts attributed to the Great Mosque of Damascus' mosaics. Reconditionning of the tesserae and fragments. Analysis of the gilted and silvered tesserae at the Centre de Recherche et de Restauration des Musées de France (C2RMF). Specialization in the treatment of Archaeological Objects and mainly Antic and Modern Mosaics. Stratigraphy, reverse side treatment, removal of an antic mosaic. De-restoration of antic mosaic and transfert on a new support, filling of the removal rows. Treatments in a workshop of the antic mosaics found under the Jean Jaures parking at Nîmes. Cleaning of the pavements and filling of the removal rows. Creation of a modern mosaic for the Grand Palais in Paris. Cleaning of a ninteenth century mosaic, tesserae reintegration. Treatment of a nineteenth century mosaic, cleaning, facing, documentation and layout on tracing paper. Documentary research in the museum's archives and parisian libraries. Gaps filling of an antic mosaic, preparation of colored mortar for the final presentation. Layout and painting of the Split's mosaics, gaps reintegration with the use of tesserae. Trigonometrical layouts of the Butrints' mosaics for a futur publication, in situ conservation treatment: uncovering and cleaning. 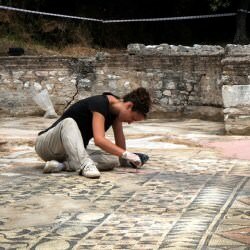 In situ conservation treatment of gaps, cleaning tests and injections, layouts, de-restoration, protection of the mosaics. Layouts and drawing of the Paphos' mosaics, Conception of the conservation project of the Achilles' mosaic (Paphos). 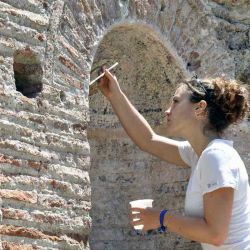 Archaeological excavation in urban and rural environment, cleaning research and drawing of the excavated artefacts, organisation of the storage space, initiation in Preservation storage principles. Chateau de Compiègne's Collection inventory, treatment of metallic historical and archeological objects. Removal of two pannels of enamelled tiles from the XIXth century. 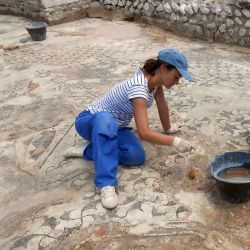 Consolidation, cleaning and transfert on a new support of the "Polychrome mosaic of the duck", IInd century A.D.
Uncovering, cleaning of the pavements, treatment of the lacunae, injections, covering, IVth century A.D. 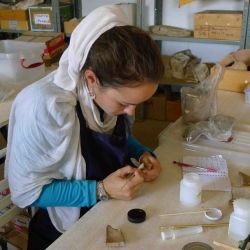 Inventory, preventive conservation, repackaging of artefacts coming from french excavations, conservation of ceramics, egyptian faiences and glass. Lecture during the JERI 2014 conference (Journée d’étude recherche et innovation en conservation-restauration des biens culturels), the 2nd of october 2014 at the MuCEM museum. Poster presentation at the ICCM Conference (International Committee of the conservation of mosaics), 27th - 31st november 2014 in Sardinia (Italy), with M-P. Raynaud, A. Islami and K. Zguro. Master's Degree, Conservation-Restauration des Biens Culturels at Paris I Panthéon-Sorbonne, Specialized in Archeological objects,June 2014. 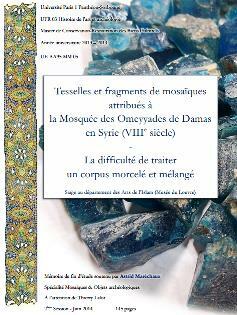 Marie-Patricia Raynaud and Agron Islami, « Corpus of the mosaics of Albania, Vol1. 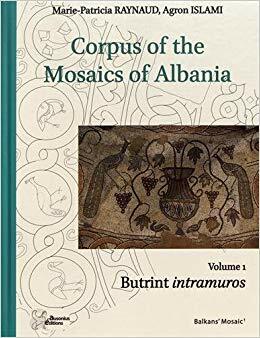 Butrint intramuros », Balkans mosaic n°1, Ausonius, 2018, 292 pages.